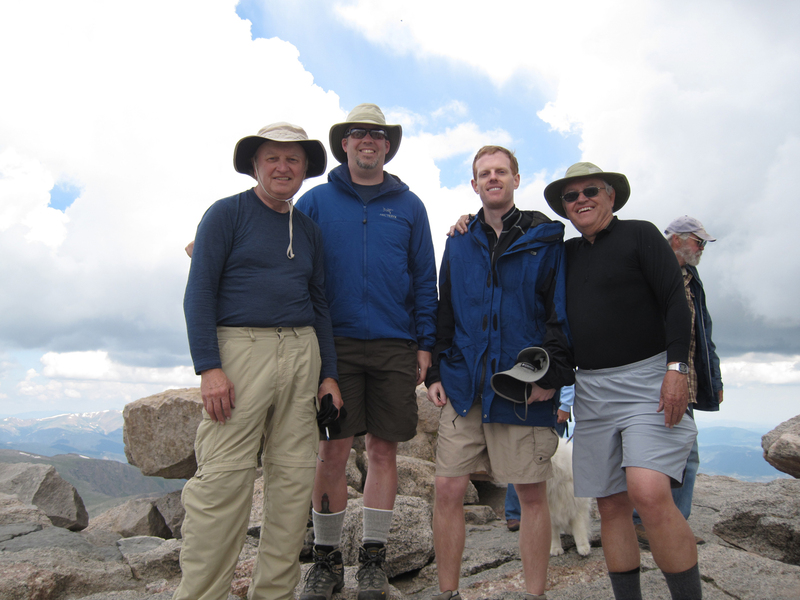 July 18, 2013 – I made the summit of Mount Evans (14,258 ft.) with my Dad Jerry McDowell, Uncle Keith McDowell and Cousin John McDowell. On my second full day in CO we hit the trailhead at 9:09AM for a shorter, easier summit after getting our butts kicked the day before. Why an easier one today? Pikes Peak will be tomorrow and it will be tough. Today’s average speeds were .1 higher than yesterdays. This could be due to acclimatization, or that it was simply a shorter easier hike. 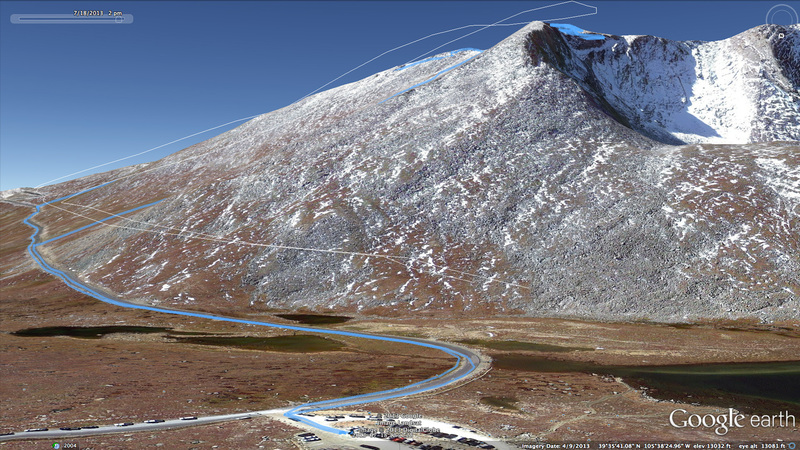 As you can see from the map, John and I went up the road a ways, then cut the corner. There was no trail here. As we got closer to the ridge, the wind became quite chilly so I stopped, took off my short sleeve smartwool and put on a long sleeve smartwool. Much better. Our Dads did not go so far up the road, but they cut at a different angle, crossing our path (way behind us) and ended up on the back side of the mountain on the switch backs of the road. While this trek up was still a bit tough on the quads, John and I made the summit easily. It was chilly up there so I put on my Arc’teryx Atom LT while waiting on the Dads. Also while waiting we could see the clouds gathering and the local rangers came up to the top with a gadget to monitor lightning. It was suggested we take the quickest way down… via the scree slope we had missed while hiking up the road. It was an obvious way up once we got to the base of it, but we somehow missed it. This was the only summit all 4 of us made together. Jerry McDowell, David McDowell, John McDowell and Keith McDowell at the summit of Mount Evans at 14,258 ft. Anyway, about 2/3 down the steep slope the rain started up. Knowing Pikes Peak was the next day I stopped to put on my rain shell (took off the Atom LT when we started down) and my gaiters. I did NOT want my shoes to get wet on the inside. The rain was never very hard, but I was prepared anyway. John and I made it to the car and the Dads caught up.